In "The Green Machine," Mayor Richard Daley takes viewers on a tour through Chicago, and showcases his mission to make it "the greenest city in America." Chicago already demonstrates a remarkable commitment to green design and construction, with over 40 buildings registered for LEED certification, an integrated solar-powered public transportation system with a biker commuter station and over two million square feet of green roofs, including City Hall. Mayor Daley has earned a national reputation for his innovative, community-based programs to address education, public safety, neighborhood development and other challenges facing American cities. A former state senator and county prosecutor, Daley was elected Mayor of Chicago on April 4, 1989, to complete the term of the late Harold Washington, and was re-elected in 1991, 1995, 1999 and 2003 by overwhelming margins. Daley's focus on quality-of-life concerns has led to greater emphasis on the delivery of basic services, from removing graffiti and deteriorating buildings to creating more green space and a citywide recycling plan. Since he became mayor, the City has planted more than 400,000 trees, created 100 school campus parks, built 68 miles of landscaped street medians and spurred the construction of rooftop gardens on major buildings, including City Hall. Johnston is the Commissioner of the City of Chicago Department of Environment (DOE). He was appointed by Mayor Richard M. Daley in July of 2005 after serving as the Assistant to the Mayor for Green Initiatives. His responsibilities include the overall management of DOE, which administers programs to protect and restore Chicago's natural resources, reduce waste, clean up brownfields, promote energy efficiency and reliability, educate the public about environmental issues, and enforce the City's environmental protection laws. Prior to working for the City of Chicago, Sadhu served as the Executive Director of the Cleveland Green Building Coalition. Farr is the founding principal and president of Farr Associates Architecture and Urban Design, established in 1990. He created a new rating system and policy for sustainable design, Leadership in Energy and Environmental Design Neighborhood Development (LEED-ND), which incorporates green and sustainable elements into site selection and community developments. Farr currently serves as co-chair of the Environmental Task Force of the Congress for New Urbanism and is past chair of AIA Chicago Committee on the Environment. City Hall. Taking up an entire city block, City Hall is a symbol of the Mayor's commitment to green design. 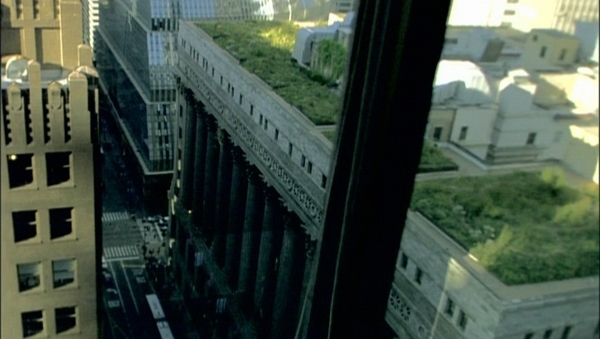 After renovating the Beaux-Arts building, the Mayor installed the first city-sponsored green roof in the United States, designed by William McDonough in 2001, demonstrating that rooftops are vastly underutilized spaces. Even the thinnest green roof can effectively absorb most rainfall, reverse the urban heat island effect and provide wildlife habitat (there's even a beekeeper who harvests honey on the roof of City Hall!). They also insulate buildings, extend the life of the roof, increase property values, and vastly improve urban aesthetics (City Hall is visible from 33 taller buildings in Chicago). In this episode, engineer Charlie Miller takes us on a tour of the roof landscape, this "living laboratory," with over 100 species of plants. Chicago Center for Green Technology. 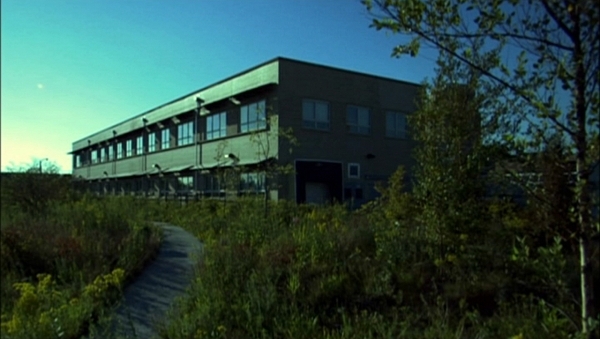 In May 2002, Mayor Daley inaugurated the Chicago Center for Green Technology in what was previously an abandoned industrial building on an illegal dumpsite. Designed by Farr Associates, the Center has earned a LEED Platinum rating and the 2003 AIA Top Ten Green Building Award by incorporating innovative technologies such as solar panels, a filtered parking lot runoff, high performance insulation, low-VOC paints, and reclaimed wood. 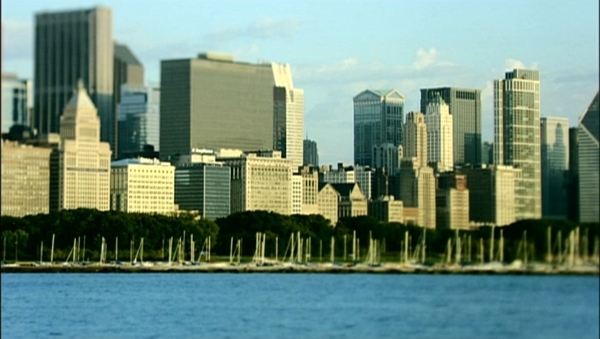 Currently, the Center is a resource for green businesses and for educating the public about sustainable technology. Design: e<sup>2</sup>, the economies of being environmentally conscious. What is it we ask of our leaders? Of our elected officials? Do we want safe choices, or make the call for bold ones? Do we expect care-takers, or demand visionaries? Today, nearly half the world's population live in cities, how will we cope as we continue to grow, expand and build? What do we ask of our leaders? And what will be the consequences of their actions? Chicago is the American city. Chicago is at the crossroads of America and feels like America to me. I mean there are a lot of cities in America that feel like America, but Chicago is the big bombastic American city. Chicago is both a museum of architectural history, a place to which tourists flock to see great buildings by Daniel Burnham, Louie Sullivan, Mies van der Rohe, and Frank Lloyd Wright, but also it's a laboratory for charting the urban future. It's a place that invented the skyscraper. It's a place that determined the shape of the City Beautiful Movement of grandly scaled classic buildings and plazas. And it's now a laboratory for green architecture because of the passion that Mayor Daley has for greening his city and beautifying his city. Mayor Daley wants the city of Chicago to be the greenest city in America. That really means that he wants the city to implement greening strategies in every part of what we do. It's really about taking advantage of sustainability principles in everything that we as a city are doing. As the third largest city in the country, that means a lot of resources. We buy a lot, we build a lot, we have a lot of operations out there. Cities are the ones that bare the burden of taking care of citizenry for the most part. I think what's really interesting that the natural resources are in the rust belt in a big way and I think turning them into cleaner, more sustainable resources will be really interesting in the next half a century or so when these cities, all of them, decide what they will do with their natural resources in addition to how they will clean up what was left by the industrial revolution. Sustainability is really about doing things better than we have before. It's finding new solutions to age-old problems. For years, many parts of the country were dumping grounds. They were a lot of illegal dumping, hazardous materials. We had illegal landfills. There were a lot of really negative things going on. We've cleaned up hundreds and hundreds of acres of brownfield sites, abandoned sites, old gas stations, illegal dumps. Let's be honest. We are not going to consume our way out of this. Not the way we're consuming now. So let's not have that fantasy. You have to set up societies in a very different way. It doesn't mean that quality of life needs to diminish. It means that you define your quality of life in a different way. When you think of the green movement, you think of what? You think of Europe, maybe. You think Germany. Maybe Japan. San Francisco. But Chicago? This grass is so beautiful when it's in the wind. There's insects everywhere. We're on Chicago's city hall, approximately four years after nature was given an opportunity to claim this little patch of the city. The original impetus for this project and the projects in Chicago in general, was an effort to use a natural, beautiful technique, to reduce the temperature in the city in the summer, the so-called Urban Heat Island phenomenon in which many, many gravel covered or gray roofs were absorbing energy, converting it into heat and raising the temperature of the city, essentially creating its own weather. It's a strategy, a component of a building that does multiple things. It filters storm water, it retains storm water, it cools the roof, it reduces heat island, it has 4 or 5 multiple benefits in one component. I'm an engineer so I tend to focus first on as we've been discussing, energy benefits, water quality benefits, storm water benefits. But the real benefit is this experience. So what we're creating is a whole new urban environment, a whole new urban context really. And that's only going to come to fruition if this spreads. In Germany, projects like this have been around for over 40 years and have every indication they're going to live on much longer. These could very well be 100-year investments. You get up high enough on the skyscrapers and you look down and see all these flat roofs and what a waste basically of property. If it was all green, how would it affect the quality of air, the quality of the environment and nature as well. So that's why it's like a big park system basically on every building. If you didn't know you were in the city, you wouldn't enjoy it half as much. Right? I could go out to a meadow and this would be nice, but being here in the city, it's great. I haven't bothered to look, but I'll guarantee you there's worms in the soil here. This environment left to its own devices will get richer and richer as time goes on. There's also spiders up here. They're actually up here for the bees. They come up here to eat the bees. The bees really like it up here, um, bees like it hot and dry. Um, As long as that's provided, uh, they also like good ventilation. All those things exist up here on um, on top of city hall. And so this is what we look for, we bee keepers a full frame of ripe honey. Those of us who served on the environment committee, the AIA, were a little surprised. We didn't appreciate at the time, why that would be the first green building policy that the mayor would adopt. We would have improved the energy efficiency, we would have substituted green building materials and the like ahead of that. The brilliance of what the mayor did was he chose a symbol that the public could get excited about. The symbolism of taking the roof of city hall, this traditional, powerful looking seat of public authority and greening it really sent a signal, and that was kind of the political kind of brilliance of it. 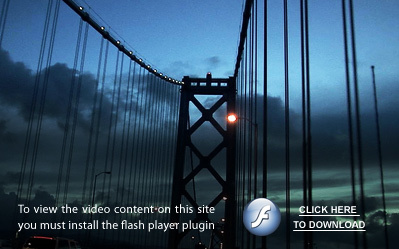 It said to developers and to public agencies, we're serious. This isn't just about a grassy roof. It's not about parks and trees. We're talking, instead, about a relationship. The relationship of the environment -- of what we build and how we build it, to the people who live there. Chicago's green movement hasn't arisen from you know the neighborhoods, and from a popular outcry. It's arisen from the passion of the mayor who really cares about green architecture. While the mayor clearly has instituted many progressive green policies such as the green roofs, there is a political downside one could argue to the way some of his green measures have been instituted. The classic example was his midnight shutdown of a little airport on our lakefront. He had always wanted to turn it into a park, which I thought was a wonderful idea because land along the lakefront should be parkland, open to the people of the city. What's driving all of this is the city's arbitrary decision to close Meigs at the end of this month. Governor Edgar promises the state will sue Chicago to keep Meigs open. The Meigs control tower radioed the news to all incoming pilots Monday morning. After 50 years in operation, it was the final day of flight at Meigs field. One Sunday night after the 10 o'clock news was over, city back-hoes headed out to this runway and gauged giant Xs into it, thereby shutting it down. Mayor Daley took it upon himself that sometimes he has to just make a decision. Sometimes he has to move the bulldozers in and somebody is going to be really angry. This was a naked display of power. You know it's my city and I'm going to do whatever I want with it. Did the ends justify the means? I think it's very hard to say. The Mayor has found that there is often resistance to true leadership. Sometimes in real leadership, you have to make hard decisions, you have to take risks and the green roof was a risk, taking over the schools was a risk and the public housing. There is always a chance that it may not work and often criticism when you first do it. Choosing to declare yourself the Greenest City in America is not a popularity contest. Regardless, some bold choices may cause one to step back, but hopefully the next move brings you three steps forward. 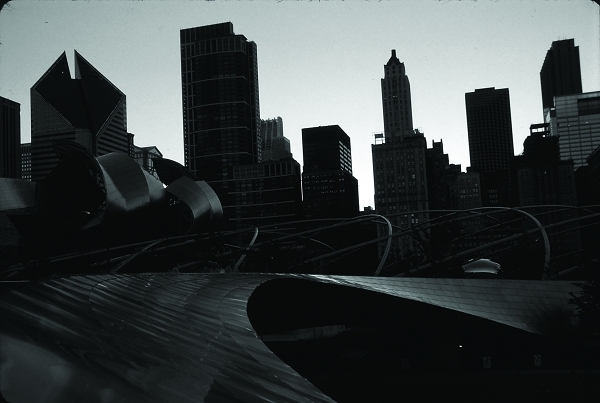 Millennium Park, has just changed the spirit of Chicago. Uh, the city of Chicago committed money from the downtown taxing district, so it didn't bother communities outside downtown. In the private sector, the business community pitched in over 250 million dollars and everything that you see is privately paid for and we only built the foundation and the garage. I think Millennium Park is the best thing that Daley has done. It's a park, and it's green. It has a green roof, a 24.5 acre green roof where before there was simply a railroad track and an open pit parking lot. 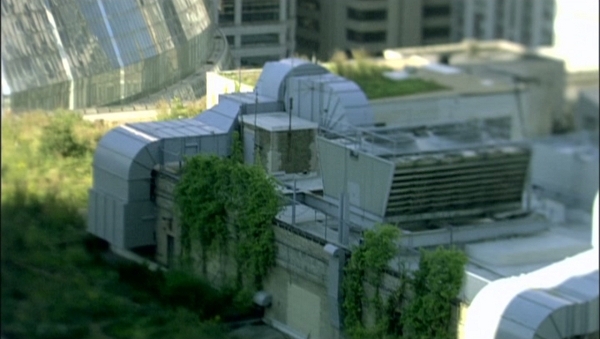 So it's visible green in that sense, you can see the green roof. It's also conceptual green in the best possible way because it's encouraged developers because it's upgraded that area enormously because it's improved the public realm. It's now a prestigious, desirable place to live. You have to do things that will change just the spirit of a city and, and that has changed the spirit of the city. Why, because it's a new concept of a park. It becomes the gathering place for people. Doesn't matter who you are, how rich you are, how poor you are, doesn't matter if you're from Chicago, it becomes a gathering place and I think it's really changed the whole spirit of Chicago now. On June 10, 2004, Mayor Daley codified that change and instituted the Chicago Standard. These new rules rewrite the standards by which public buildings are designed, built and renovated and aim to conserve energy and reduce operating costs. There's a system called LEED, which is Leadership in Energy and Environmental Design and it's a really a development of the U.S. Green Building Council and it certifies how green buildings are. Using those strategies we found that they work and then the mayor went out and created a policy that said every new building in the city of Chicago that is built by the city or our sister agencies must be a LEED certified building. The Chicago Center for Green Technology is a two story building, 34,000 square feet, it's a brick building that dates from the 1950's. It is a LEED Platinum rated building, which is the highest rating that LEED gives. It was the third such platinum building in the world when it was finished at that time. The anchor tenant was Spiral Solar Chicago. That's a business that manufactures photovoltaic solar cells here on site. The building itself was the first client of the output of this assembly line here in the building and so the building has roof top and ground mounted three different types of photovoltaic cells that when the sun strikes them they generate electricity. All the storm water on site flows to a detention pond. We put the geo-thermal heating and cooling system and the pipes for that system under the detention pond because it improves the efficiency of heat exchange by about fifty percent. So those two things when we did our brainstorming session seemed to make sense together. In terms of the design or the building I can only say that everyone that works here loves it. Uh, the natural light is great, the materials are healthy, it just has a great vibe. It's one of those places you wanna be and so as an architect it's hard not to be pretty happy with that. I think the environmental center, again signals the City's commitment to green architecture. It's a laboratory, it's a way to demonstrate, you know the importance of what green things can do. At the time we conceived of the Chicago Center I never would have imagined the impact it would have and the way in which the city of Chicago would back it and promote it and use it intensely. I was here for a greening fair last Saturday and hundreds and maybe even a thousand of people toured the building and learned about what they could do in their homes. The city is just great at using it as vehicle to promote a bigger agenda. We really started with the creation of the Chicago Center for Green Technology and so that was our kind of first attempt to say well how can we really take the ideas embodied in the environmental features of the green roof on city hall and try them holistically in a building. And what we really found is that many of these strategies are pretty straight forward. It's not rocket science. We can implement these strategies on many of our buildings. If sustainable building practices make so much sense, why hasn't the private sector jumped in with both feet? Or with one foot for that matter? For Chicago, it means staying the course, leading by example, and showing that the math works. American developers don't want to pay the additional first costs, the upfront costs that green architecture requires. The tax laws and other things are structured such that they just don't see it as good investment, but it is significant that the city is requiring public buildings, which it can control, to have green elements in them. That is a good first step. There's always the perception that green building costs so much more. We're finding that cost is coming down considerably as we become more educated. The first couple of projects there's the kind of a steep learning curve with our own project managers. Now that we've done a few them, that cost is coming down considerably because we know how LEED works, we know what the priorities are, we know what the opportunities are. The initial cost of constructing a building is really only about ten percent of the overall cost of owning and operating that building over its life and so that we as a city as the owners and operators of that library, or that police station, or that fire station over its fifty or a hundred year life we're gonna be paying a lot more than that initial investment in the building. When we came into this building from our old one we were averaging 20 officers sick a day. Right now we're averaging about twelve, which is a thirty three percent increase. So it's either the atmosphere or the healthiness of the building. The building itself uses twenty percent less energy to heat and air condition it during the year. The roofs and the parking lots are made of reflective material so the sun doesn't build up and re-heat the building. The building itself was built with fifty percent recyclable materials. This floor that we're standing at is all recycled glass. Buildings like this help our moral and the community's. We have rooms that the community can come and use, which they do, a lot, for meetings and things. It's led to more interaction between the police department and the community because of this building. We've really been asking how do we make residential in Chicago more environmentally friendly and more energy conservation oriented and so we've done a number of things to help residential projects go green. One of the first things that we did is we did an international design competition and got a number of great proposals and we built five green homes. 'Green Homes for Chicago' we called them. We had open houses. Thousands of people came through them. We built them and then we sold them as moderate income housing. This was the most experimental house out of the five. I can't say that I was specifically looking for an environmentally friendly home. I kind of fell into green technology. The elements that went into the house were cork floors. The porch is made out of epay, a fast growth forest wood that can regenerate itself. There are "pavers?" so water can percolate through. There's a bottle wall and I think it has 270 plus bottles on it. The sunlight comes through the clerestory windows on the roof and actually hits this back wall thus heating the bottled water that would then be a passive heating system. I mean that's the first thing I want to show everybody because their jaw just drops. I think the Factor 10 house is important. Green buildings don't necessarily have to shout at you and say, "I am Green!" Green can simply be layered into other elements of design and integrated with them in a way that's sympathetic to existing neighborhoods and the way, just the way that people live. With the first couple of pilot projects that really showed us how to do this and really got our education of our project managers up to speed and then the mayor went out and launched the program for citywide. We've done a lot on our own projects and then have created policies and programs to insure that the private sector are implementing green building strategies as well. So we're seeing Target stores are now doing it, Home Depots, McDonald's has a green roof, Apple, the Apple store downtown has a green roof. So we're seeing a lot of exciting commercial projects going for LEED certification. Those are green band-aids. I mean, those are not, you know, those things are good to an extent, but they're not the whole ball of wax. And I mean, I think it's incredibly ironic to have a green roof on top of McDonald's, which is really about the drive in culture. I mean that's the ultimate contradiction. It's like putting a piece of lettuce on top of a bacon double cheeseburger and saying that's it's going to help you control calories. That's bologna. All the green buildings in the world aren't going to amount to a hill of beans unless we adopt a green way of life. A way of life that includes not only a great public transportation system, but alternative methods of transportation that further promote engaging in sustainable culture. The bike infrastructure here in Chicago is something we've really focused on. We have ten thousand bike racks in the city, more than any other city in the country. We've got a bike commuter station, with three hundred indoor air conditioned/heated biking parking spaces, with a café, bike repair and bike rentals, showers and lockers. So we're really building the infrastructure and making it easier for people to make the environmental choices as a critical part of further implementing environmental strategies. It might have started off as plantings on the streets or planters, or new trees being planted, which is obviously needed in every city, but then it became much bigger than that. Most people expect a city to be steel and concrete and dirty and no benefit to the environment. And to maybe work there and get out as quickly as possible. So I always believed nature can co-exist with an urban community like ours. You know the joke was that he was kinda Martha Stewart in the Mayor's office. He was just doing civic decorating, but he evolved over time and he is pursuing more sophisticated green policies now. As cities grow, populations increase, and resources diminish, what is it we ask of our leaders? What do they ask of us? And most importantly, what do we ask of ourselves? I would hope that green is mainstream in 10 years. That means when you're going to construct a building, when you're going to remodel, you're concerned about the quality of air in a building, you're concerned about what type of material they're using in a building. And so to me that requires all of us to really make a commitment. 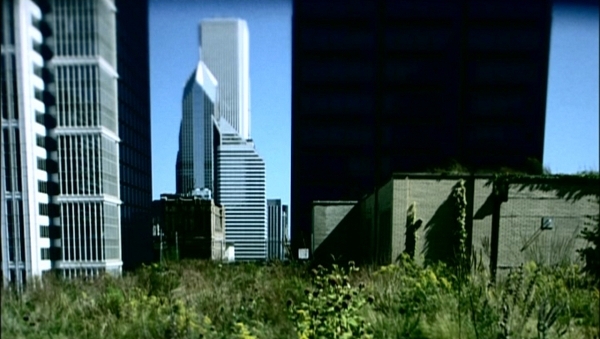 You know, when you're in Chicago you have to ask yourself, can you have a green city without an enlightened dictator? That top down approach has clearly resulted in a more green city, um, but one can certainly ask whether it's had a salubrious effect on the body politic and one can argue that it has not. A lot of what happens in sustainable culture is somebody taking the lead and somebody making leaps that aren't expected and somebody saying that this has to be done. People ask us can we afford to build green buildings and our response is: can we afford to not build green buildings. I'm certainly daunted by the condition that the planet is in, but I'm extremely optimistic about what we can do. If you look at the industrial revolution, what we've done over years how when we as a species group together to have an impact, we can do it.